Asia manufacturing PMIs continue weak in data reported in the New Year that are up-to-date through December 2018. The rank standing data are very mixed with China logging a very low 2.9 percentile standing and Malaysia on an all-time sample period low. These compare to India at a 90th percentile standing and Indonesia at an 85th percentile standing. Myanmar and Vietnam log standings in their respective 81st percentiles. But Asia is less mixed than it seems. Asia has been struggling for better growth. The average (unweighted) manufacturing PMI in the table for December is a weak 51.1 with slowing in half of the reporters in December compared to November as a similar splint exists in November compared to October. 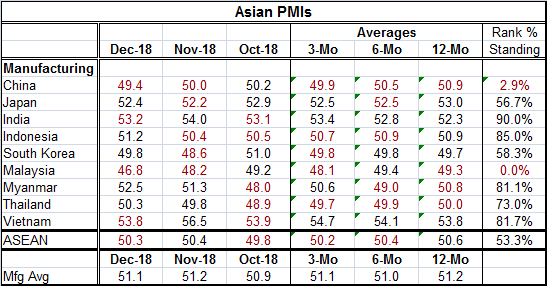 Three economies log PMI values below 50 indicating manufacturing contraction: China, South Korea, and Malaysia. Out of ten reporters, only two have PMI raw scores above a diffusion reading of 53. The readings for ASEAN and Thailand are on the brink of showing a contraction for December with a level of less than one half of one diffusion point above neutral. The more erratic percentile standing data –that are based on these same weak diffusion data- simply reflect that for some of these nations there has been a long period of weak performance and by those standards the current crop of readings is not anything new. Only India and Vietnam are showing anything like ongoing firm readings. In fact, both of them show sequential average readings that are getting progressively stronger- setting them quite apart from the rest of Asia, especially China. In contrast, the progressive readings for China and Thailand are getting progressively weaker for the shorter horizons. As the New Year starts, there is also geopolitical news and for Asia that news is not reassuring. In China, Xi Jinping has given his Happy New Year...or else… greeting to Taiwan warning it that it must eventually acceded to China's rule, a long standing position of China but one he makes more forcefully in early-2019. In North Korea, Kim Jong Un is threatening to walk a new path without specifying where that might lead or how he might do that. North Korea is anxious for the U.S. to show a sign of faith and drop some sanctions while the U.S. is reluctant to take the pressure off that seems to have brought North Korea to heel. In fact, the U.S. has done this before with North Korea, cutting it slack, only to find that without ongoing pressure there is no progress on North Korea's part. Markets are unsteady. Oil prices are falling. Gold prices are firming. All this is as the New Year begins. In the U.S., the White House has rejected a Democrat plan to end the government shut down calling it a 'nonstarter' as the President has invited party leaders to the White House for a briefing on border security. All this makes in painfully clear that you can flip a page on the calendar and reveal a new picture, but nothing else really has changed. There is lots of talk about a New Year, and turning over a new leaf and having New Year's resolutions. But one year flows seamlessly into another and the problems of late-2018 are still the problems of early-2019. In so many ways, the transition for December to January is no different from going from June to July. Well-wishers can Happy New Year us until their lips turn blue in the cold of January weather (at least as it typically in the north and eastern United States where I am based). But nothing is different. When Mr. Trump was asked if he thought Elizabeth Warren, who just announced her candidacy for President as a Democrat thought she could win, his response was that you would have to ask her psychiatrist (Source here). There will be no kinder gentler Trump in 2019. And as Democrats take control in the House, we can look for increasingly less civil exchanges. Meanwhile, the PMI readings make it clear that growth is slowing. It is slowing globally and it is not clear how fast or deep the slowing will come on in the U.S. But it is in train. I had been warning that the Fed seemed too much on auto pilot with its program of rate hikes and that the December rate hikes did not seem at all consistent with incoming data. Yet, the Fed did hike rates and now the forward-looking expectations of many market watchers are being cut sharply. Clearly, the trade war with China is taking a toll. But just as clearly U.S. rate hikes by the Fed are taking a toll on U.S. growth especially on the housing sector. The government is shut down. Democrats seem to have set opposing and defying Trump as their New Year's resolution. This does not seem like the basis for a 'Happy New Year' for anyone to me. Can the U.S. two-party system find happiness in discord? I doubt it.